Lydia recently sat down with Alex Simoes, who plays Lorenzo in Melancholy Play. They discovered a shared love of Nutella and Top Chef (is this a Quick-Fire Challenge in the making?). LA: Tell me about Lorenzo. AS: Lorenzo is a challenge. Like me, he’s struggled with finding his cultural and emotional identity. He comes from an Unspecified European Country. He’s an orphan. His mother abandoned him specifically saying he looked like an American when he smiled. So even though he’s European, he’s shunned it, just like he’s shunned a lot of his emotions. He doesn’t feel the suffering of Europeans. But he can be happy in the US. He’s a therapist, so people deposit and share their pain with him. Then along comes Tilly, who opens Pandora’s Box and he starts to feel those emotions again and realizes he also wants someone to deposit and share his pain with. LA: How long did you work on the accent? AS: Not long! Western and romance accents come easily, especially if they’re Unspecified! I actually kind of based it on Fabio from Top Chef. AS: You can’t hate Fabio! It’s the accent! People like accents. And like with Fabio, people fall in love with Lorenzo, it just happens. LA: You were born in Boston, but lived in Venezuela during your childhood. You told me once that you always find yourself drawn back to Boston. Why is that? AS: Yeah, I was in Venezuela from the time I was 2 until I was 17, so 15 years. I came back for college because I wanted to come back to where I was born. Plus I’m a Red Sox and Patriots fan. I’ve moved a lot, but every time I try to leave, some other project comes up. I’ve left 3 or 4 times, and every time within 6 months, I’m back. LA: What is it about Boston? AS: I think it has a great balance. I can do theater and I can work my computer gigs. People sometimes think there’s a ceiling here, and if you want to work in theater you have to leave, but there’s so much the city has to offer. Plus, I find places like New York and L.A. get lonely. LA: Speaking of lonely, what do you do when you’re melancholy? AS: I play guitar. Or I listen to music and stare at the ceiling. I’ve been listening to a lot of Beatles lately, and I really like trip hop. It has this great combination of anger and relaxation. LA: What’s your favorite candy? AS: I love sweets, but I’m more of a dessert and chocolate guy. I can just reach for a jar of Nutella and eat it with a spoon. Lorenzo eats marzipan, because to him it means something. It’s a root to Europe. But I don’t have a taste for it. LA: Maybe you can talk Bevin [O’Gara, Melancholy Play’s director] into replacing it. LA: I bet you could get a sponsorship deal out it. LA: What have you been in lately, besides Melancholy Play? AS: I’ve been doing theater in Boston for about 7 years, so I’ve worked with lots of great groups. Commonwealth Shakespeare, the ART, the Publick Theatre, Stoneham. But lately I’ve been focusing on collaborating with people I find interesting and who I want to work with. Like Bevin, I’m very excited to be working with her. LA: If you could be any inanimate object, what would you be? Katie said a book. AS: I know, she took the best one! I think a musical instrument, like the guitar. That’s a good poetic thing. 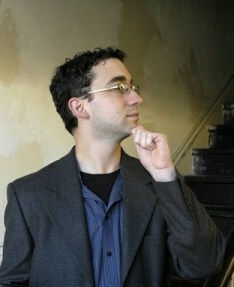 See if Alex becomes the new spokesman for Nutella in Sarah Ruhl’s Melancholy Play at the Factory Theatre March 12-20. Tickets available at theatermania.com.